This 70% (v/v) isopropyl alcohol (IPA) solution is made to USP specifications and is filtered to 0.2µm to remove particulate contamination. It evaporates completely, with no rinsing required. 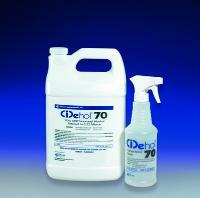 Ideal for cleaning surfaces and hoods in microbiology labs or tissue culture labs. Effective in cleaning surfaces and process equipment in pharmaceutical, biotechnology, medical devices, cosmetic, and food production areas.